PHOENIX — The Arizona Antelope Foundation is seeking volunteers Aug. 12 for a fence modification project in the Spring Valley-Government Prairie area about 17 miles west of Flagstaff and 11 miles north of Interstate 40. 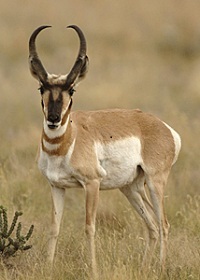 The project activity includes removing fencing around a wildlife water and modifying fencing to pronghorn-friendly standards in various locations. The project will improve an existing pronghorn movement corridor from their summer range on Government Prairie to winter habitat in the Ida and Babbitt grasslands to the north. The project begins at 8 a.m. Aug. 12. The organization will provide dinner for all volunteers Aug. 11-12 and continental breakfasts Aug. 12-13. Volunteers are asked to provide their own lunch to eat in the field Aug. 12. Volunteers also should bring work gloves, snacks, water, personal gear and an orange safety vest (otherwise, one will be provided). Sign up by Aug. 8 by e-mailing info@azantelope.org. For more information, contact Glen Dickens at (520) 247-4907. For a printer-friendly map to the campsite, visit www.azantelope.org.